Turn your marketing from reactive to proactive with personalized, 1:1 campaigns that are triggered off of key attributes, such as customer data, product data, purchase data, onsite behavior, and predictive data sets. Gain access to 3+ years of data – eCommerce, ERP, POS, etc. 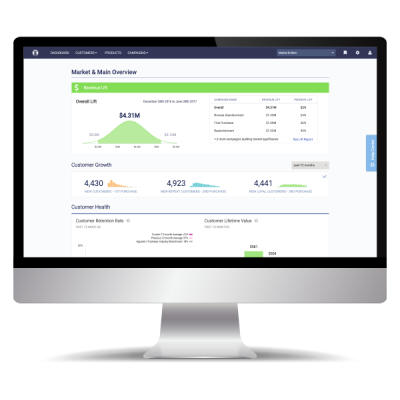 – and engage with customers across platforms at every stage of the buying lifecycle. WhatCounts’ Automated Personalization Platform gives you the tools to slice and dice your data, using our advanced segment builder, and create targeted, automated cross-channel campaigns. We pull 3+ years of data out of your eCommerce platform, ERP, and POS solution, clean it up, and push it through our proprietary algorithms to layer predictive data sets on top of your standard (customer, purchase, product data) and custom fields. These campaigns are completely customizable and are triggered off of customer, product, purchase, and predictive sets, as well as onsite behavior, such as browsing the site or abandoning a cart. You’ll also have access to metrics, including revenue lift, on your campaigns so you know which ones are working and which ones you may need to revisit.